Home » Atlanta REIA Blog » Articles » Numbers and Statistics… What Are They Good For? Obviously, numbers and statistics and the correct understanding and application is crucial to any business model. But something which does not get that much attention is the incredible importance of where you draw your statistics from, do they come from reliable sources are they relevant to what you are engaged in or are they erroneous or misleading and of no value whatsoever. As someone who understands that correctly obtained and used information will not lie to me, I am sometimes astounded by what people take as accurate and truthful. Attached below are numbers generated by the NAR. You would of course believe that these are very good and valid numbers, but if you take a close luck you’ll find that’s not actually the case will get into that further in the moment. Let’s take a look at the two primary statistical methods for determining values first used by the NAR media and and second average. In probability theory and statistics, a median is described as the numerical value separating the higher half of a sample, a population, or a probability distribution, from the lower half. The median of a finite list of numbers can be found by arranging all the observations from lowest value to highest value and picking the middle one. If there is an even number of observations, then there is no single middle value; the median is then usually defined to be the mean of the two middle values. An average is a single value that is meant to typify a list of values. If all the numbers in the list are the same, then this number should be used. If the numbers are not the same, the average is calculated by combining the values from the set in a specific way and computing a single number as being the average of the set. I have always liked the use of average do the primary principle that gives us a much larger data set and more data means a better utility hypothesis. As an example: 100 house sales would equal an average of the total value of the sales prices divided by 100. The median number would be the numerical middle number of the bottom half or 50 in the middle number of the top half or 50 and then the middle number of those two results. In most business applications due to the finite number of data sets medium is far less accurate than average. 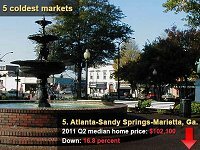 To bring this into our marketplace national housing prices and values will be significantly different from southern prices of values which will again be different from those in Georgia which are still different again from those in metro Atlanta which are even still different from neighborhood or market neighborhood and market. All that being said, the NAR has determined that the median house value in Atlanta, Marietta, Sandy Springs has fallen more rapidly than all but four other markets in the country. Better still they say that this value has dropped from $121,000 and change by almost 17% to just over $102,000. The point is that you really need to be sure of the numbers you’re using and their validity to what you’re trying to achieve. This is just my opinion. Joe Thompson is an experienced business and financial consultant with over 28 years experience. Joe is also a sub group leader for the Atlanta REIA weekly Haves and Wants Meeting, Atlanta’s premier networking meeting for Real Estate Investors having facilitated over $120,000,000 in transactions over its 5 year history.